Spondylitis is referred to the painful inflammation of the vertebral joints and their associated structures. Basically, it is the Arthritis of the spine. In Ayurvedic terms, when a person indulges in Vata-aggravating diet and lifestyle, then Vata (biological air) circulates Ama(toxins) in the channels of the body and deposits it in the spine discs, causing Amavata. 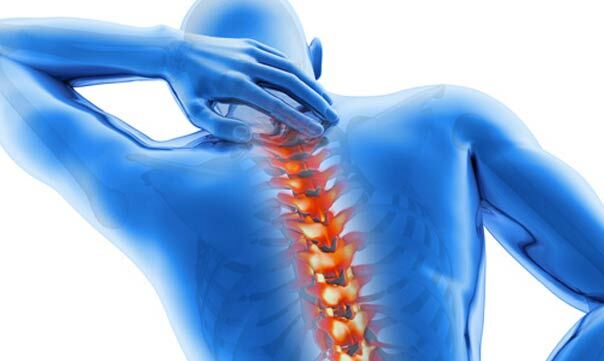 This can also cause swelling and inflammation of the tissues around the spine and lead to long-term/permanent disability. So, Ayurveda focuses on the cleansing of the body of Ama (detoxification procedures), dietary modifications, lifestyle corrections and medications to manage the disease. Cervical Spondylitis: It affects the cervical vertebra, causing pain to spread the back of the neck. Lumbar Spondylitis: It affects the lumbar vertebra, causing pain in the lumbar region. Ankylosing Spondylitis: An auto-immune disease generally affecting the sacroiliac joints. It causes stiffness and discomfort in the areas of neck, spine, jaw, shoulders, hips or knees and impairs movement partially / completely. Severe pain and/or stiffness in the neck, shoulder or back. An uncomfortable sensation in the nose while turning neck. Lack of coordination and balance in the body, especially during walking. Difficulty in controlling your bladder. Tingling sensation or numbness in your shoulder, arms or legs. Akami Ayurveda has a very effective and comprehensive approach towards the treatment of this disease. Our Ayurvedic doctors assess the patient history, his body type (Pitta, Vata or Kapha), lifestyle and diet patterns. Then, basic physical examination of pain area is done combined with a thorough review of the prescribed test results (diagnostic tests, X-Ray, MRI etc). All this information is used to ascertain the nature of the disease and appropriate treatment plan. Ayurvedic Panchakarma procedures to remove Ama(toxins) and to balance Vata(air). Medicated massage therapies for reducing pain. Ayurvedic medication using herbs (saunth, guggul, turmeric, fenugreek, ashwagandha, giloy etc.) for alleviating pain, reducing inflammation, managing muscular spasms, and removing toxins from the body. Rasayans for protecting tissues, improving body balance, immunity, and spine bone stability. Uterine tonics (for women) to supporting and nourishing the body. Our program includes physiotherapy and yoga sessions to improve flexibility and strength of the affected region. Physiotherapy is also used as a measure to prevent further damage to the body. We teach Pranayama (Nadi shodhana, Chandrabhedi Sheethali and Bhramari) and include it into the daily routine of the patient. These programs are usually planned for 7 /14 / 21 / 28 days of in-house stay. For more information or to book an appointment with our doctors, please call us on (+91) 9020162016.